Last week the papers were full of news of schools banning packed lunches. Behind the headlines was the release of a report called The Independent School Food Plan. The plan outlines a number of recommendations to change the eating behaviours of school children in the UK. One of those recommendations is that 70% of school children should be eating school dinners. The idea is that schools lunches are healthier (although we know that not to be the case in many schools) and parents can’t fill lunchboxes with ‘junk’. It would also provide a much needed source of income to schools which would then fund making school dinners better. You can read the whole report here. The reaction from mums on twitter and in our facebook group wasn’t very positive – whatever the thought process behind the plan they wanted to have the choice to decide lunchbox or school dinner. We know from our research in The Big Mum Opinion that lunchboxes are a daily topic of conversation – how can mums balance the ‘rules’ that schools set about what can go in lunchboxes with what their kids like (and will eat) and healthy eating? 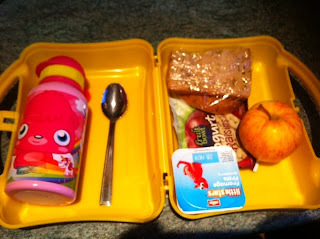 So how can brands help mums with lunchboxes? Mums have different budgets for their child’s lunchbox but the cost can add up when you have to provide 5 meals (and more if you have more than one child) so mums are always comparing costs. Mums will balance health considerations with price but if it’s a ‘small treat’ (e.g. a chocolate biscuit versus a ‘healthier’ biscuit’) then price may win. Mums often buy in bulk so find special offers for lunchboxes attractive. Mums want to vary the lunchbox for different nutritional as well as taste requirements. Children have fads, allergies and different wants. Give mums choice. Many mums would love to feed their children healthy, tasty, nutritious foods every single day. But we often need ideas and inspiration. Could your brand be that helping hand that mums need – offering great ideas that satisfy kids and school rules around what can go in lunchboxes? What’s the nutritional value of their lunchbox? Our mums tell us that they make the ultimate decision about what goes in the trolley. The kids don’t normally decide but we do want to keep them happy (and safe if they have allergies etc) so think about what appeals to kids but satisfies parents needs. At the end of the day if the child doesn’t like the taste it won’t be bought again. It sounds really obvious but let us know it is good for the lunchbox (recommended and used by mums and kids) and whatever the product is make it lunchbox friendly, packaging, size, easy to find in store and easy to open. If you want to know more about research with mums or marketing specific products to mums drop us a line.